Concentrator Purge and Trap CDS 7000. Designed for the analysis of volatile organic compounds in water by Purge & Trap (dynamic gas extraction with capture of components on the sorbent). Possible to use bubblers of 5 or 25 ml. Control of the concentrator is performed by the personal computer using an interface RS232 or through the front control panel. 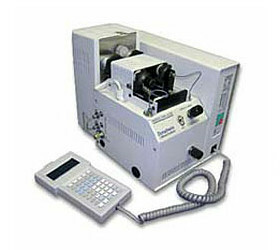 Thermal desorption is a two-step technique of assembly / concentration of sample and transfer it into the detector. 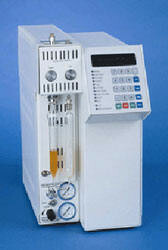 Thermodesorber 9300 accumulates analytes to the sorbent, packed in a glass cartridge, and then directs the sample to the gas chromatograph where the components are separated, identified and measured quantitatively. Thermal desorption uses heat instead of solvent extraction, therefore, on the one hand, the whole process is faster, on the other hand, there is no peak of the solvent in the chromatogram. System 9300 uses a combination of two traps: the first large-capacity trap is designed to concentrate the analytes from a sample of large volume, the second trap is focusing, its task is to provide input of the sample in the chromatograph column as a narrow front. Transfer of analyte in the focusing trap enhances injection efficiency. Since for the accumulation of sufficient amount of the substance sampling and concentration process itself can be very long, to achieve the required sensitivity purge of the trap by many liters of the analysis sample may be required. It also reduces the effect of water: the flow of gas-carrier blows away moisture from the sorbent and carries it to the dump.